The Siglos Family Limited Edition is a sharp and excellent projector thanks to the new 4k-Interpolation engine and its 60,000:1 Native Contrast Ratio and 600,000:1 Dynamic Contrast Ratio. The Siglos Family accepts 4K@60Hz signals on both HDMI inputs. Thanks to the precise 4K-Interpolation, the projector upscales and displays any resolution in 4K resolution. Siglos Series feature the latest evolution of the award-winning 4k-Interpolation engine and now it tremendously improves the perceived details and also generates greater picture depth. No more battery to replace, the 3D-glasses are now equipped with USB-rechargeable batteries. The Siglos Family comes with 4 simplified profiles. Each profile is pre-calibrated to deliver out of the box, a rich and colored picture. The expert calibration menu is now available to the most demanding users. Each calibration set can be stored into one of the 4 User profiles. Thanks to the bright 1300 ANSI lumens output of the Yunzi+ Series, they can be used with medium to large screens up to 240 inches diagonal, for both 2D and 3D projections. The Siglos Family is also available in the classic glossy white and glossy black finish. Lamp consumption – 230 W Bulb – up to 4 000 hours (with lamp used in standard mode). Brightness – 1,300 ansi Lumens. Native contrast ratio – 60,000:1. Dynamic contrast ratio – 600,000:1. SLM, Smart Lamplife Management – Automatic (Configurable). Expert calibration menu – Yes (for calibration expert only). Picture mode presets – 4 + 4 User Modes. Colour space profiles – 10 presets + 5 users. Home Cinema Video Processing – 400Hz Crystal Motion®. True Cinema Black III®. 4K Interpolation (3850 x 2160). Screen Adjustment – 106 Modes. 3D Compatibility – Frame Packing, Side-by Side and Top-Bottom (including 720p/1080p24 Side-by Side). 3D Features – 2D to 3D conversion, 3D V-Stretch (for theatre system kit). Box Dimensions – 610x580x410 mm 21.5 kg. 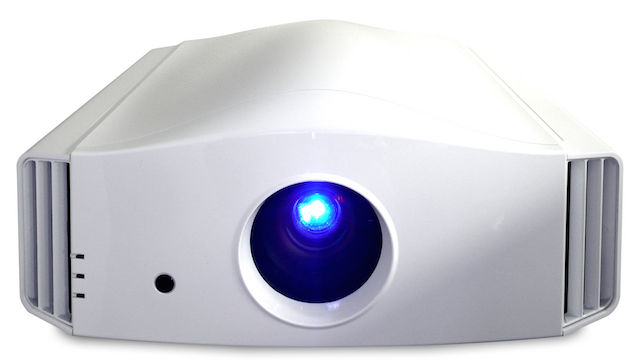 Options – 3D Glasses, Theatre System Kit, Ceiling Mount Kit, Motorised Lift, Special Colours and Finishes. Colours – Standard colours are glossy White and glossy Black. Life collection – Colours to suit your decor based on RAL classification – Add AUD$895.00. 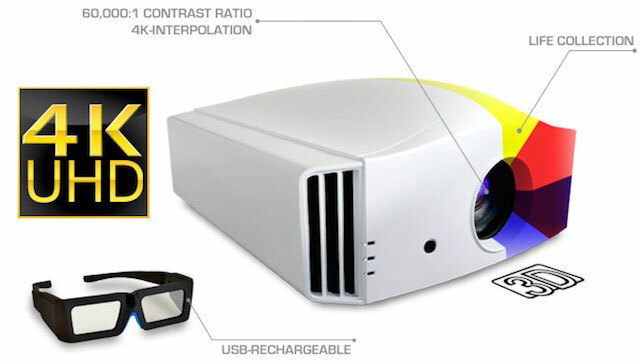 Siglos Family Limited Edition 4K Infrared Active 3D Home Cinema Projector – AUD$11,350.00.